Close your eyes for a while and ask yourself: Am I happy? Am I living a fulfilled life? Am I doing what I love? Is something missing in my life? Many of you will realize that you want a positive change. You have unconsciously made certain choices in the past that have led to your current state of being. You have the option of eradicating suffering and emptiness from your lives. If you genuinely wish to experience this state of liberty, Z Meditation can be the way to this big change. All participants will stay at the Z Meditation Center. All accommodations are included in the price. Rooms are available for groups of four to six, for groups of two, and for single occupancy. Z meditation retreats are held in silence. Students are able to remain indrawn while they are learning about the deeply hidden unconscious conditionings of their minds. In silence, they are more aware, and their decision-making capabilities also become very strong and determined. "Happiness is a decision that you can make no matter what the apparent circumstances or conditions are. It matters not where you seem to be or what you seem to be doing. None of these are the controllers of your happiness. It is only your own decision to side with the truth that you are one with happiness itself and therefore must be happy. There is no other possibility." Z Meditation work is a life-altering experience. The priorities of the participants get an inward shift, and life becomes full of joy and love. They should be ready to put in hard work required for their growth. It will be very rewarding. This is how your day will be divided during the Z Meditation retreat. This retreat will take place at Z Meditation Center in Dharamsala, India. Food is vegetarian and conducive to meditation. Please book your flight to arrive at Gaggal Airport (DHM). Transfer to and from this airport is available upon request. You need to pay 15 USD each. Those who come to Dharamsala by air may come at least a day earlier, as there is no guarantee that the flights may not get canceled. The same applies for leaving as well. Airport: Gaggal Airport Airport transfer available: Gaggal Airport (US$15 per person) Additional charges may apply. You can request this in the next step. 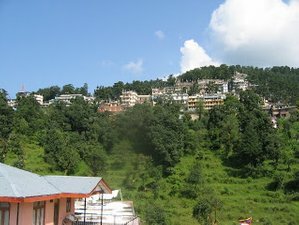 Z Meditation Center conducts silent meditation retreats in Dharamsala, India, which are aimed at deconditioning the mind of its painful stories.